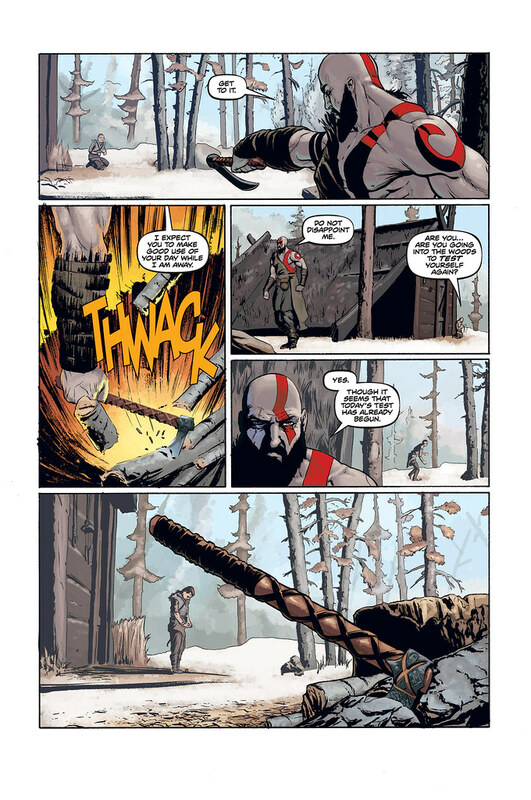 When I was first approached about working on a new God of War comic, a prequel to this year’s PS4 game, I was both intrigued and intimidated. 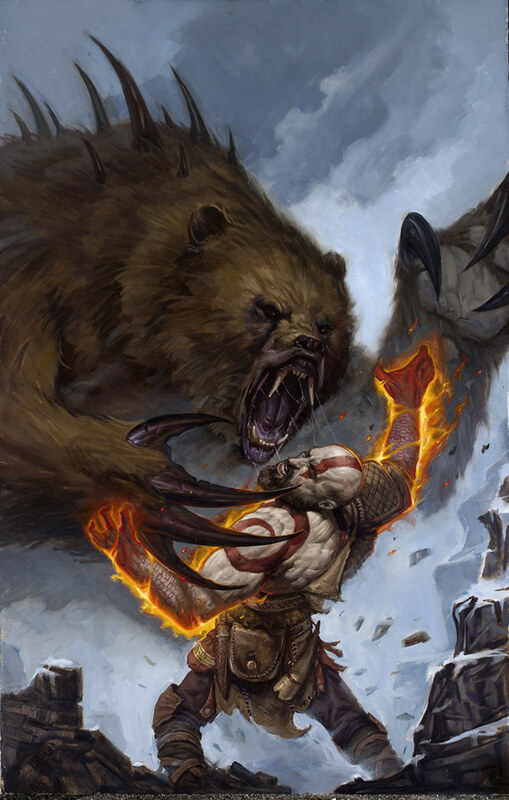 Intrigued, because I knew from the early promotional stuff I’d seen that the new game would move Kratos away from his roots in Greek mythology and transplant him in a new setting, drawing instead from Norse myths and legends, which I’ve been obsessed with since I was a kid. Intimidated, because it promised to be a huge job. 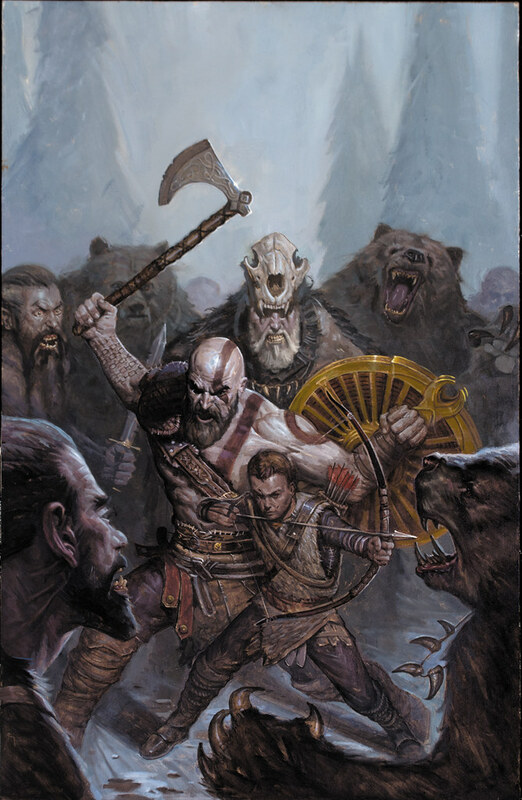 I’ve always loved stories that take characters from one setting or era or genre and drop them into another—samurai warriors in the Old West, western gunslingers in the African jungle, and so on—and the story-telling possibilities of taking a character like Kratos and running him up against the kinds of obstacles he might encounter in a world filled with ice giants and trolls were too intriguing to pass up. But at the same time, I was intimidated to be tackling such a recognizable and well-established character and to be contributing to a franchise with such an enormous scope and backstory. Because it was clear from the outset that what Santa Monica Studios and Dark Horse Comics had in mind was a direct prequel to the events of the new game that would be in continuity, and I knew from past experience working on similar projects that meant a lot of moving parts. 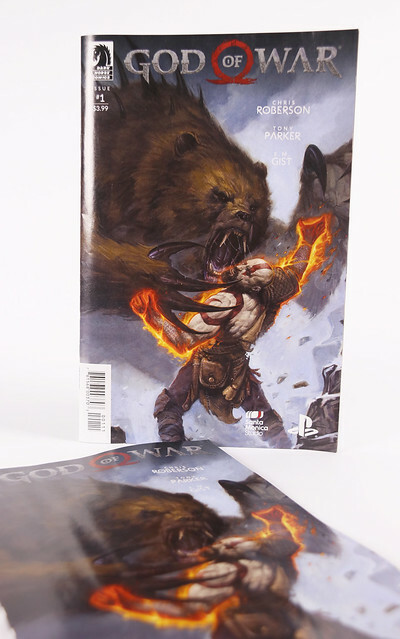 Thankfully, everyone involved with the project from my artistic collaborator Tony Parker to the editorial team at Dark Horse to Cory Barlog and the rest of the team at Santa Monica Studio really showed up and helped bring the story to life. I had the basic outline of the plot worked out in the course of my first conversation with Spencer Cushing at Dark Horse, who was the one who originally approached me about the project, but it took some time to work out if it made sense in terms of the continuity of the new game. 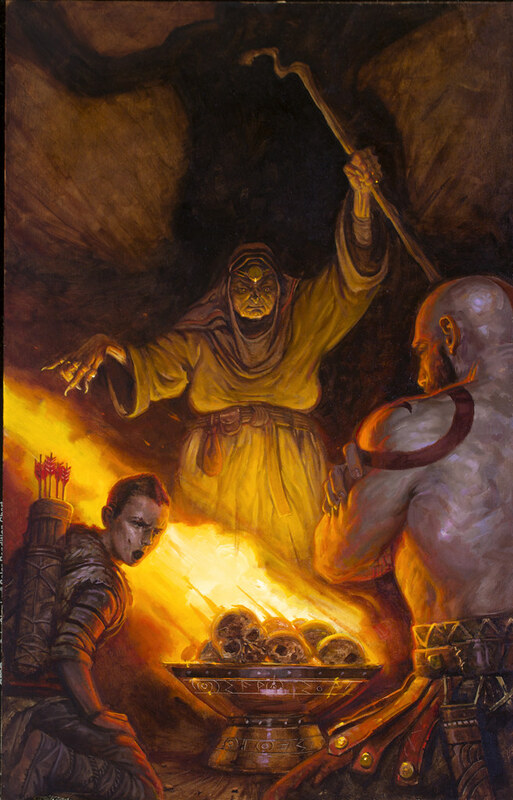 I was sent a massive amount of background on what the team at SMS had come up with to that point, from outlines to world-building materials to incredibly detailed character backstories, and learned that the antagonists that I’d originally considered using in the prequel comic had already been incorporated into the game. But I noticed that some of my favorite bits of Norse mythology hadn’t yet been used, and fired off a series of questions to the team at SMS about their thoughts, and they sent back more ideas of their own, and from that point, the story came together really quickly. 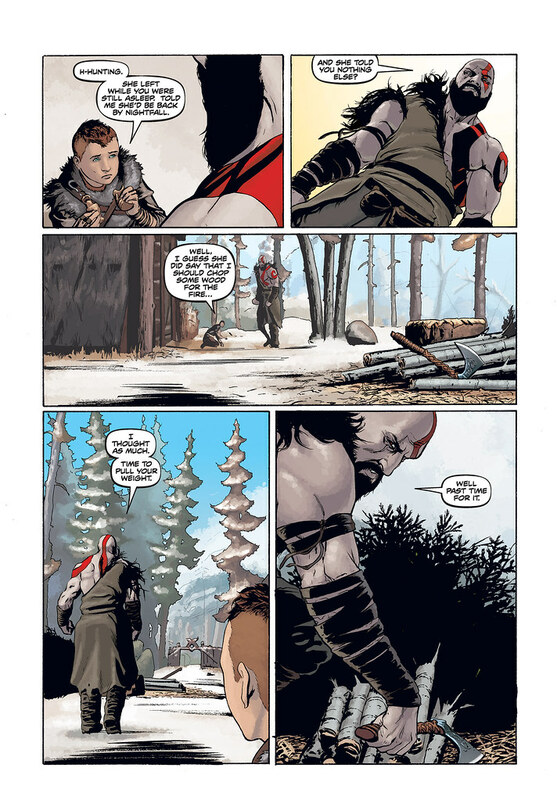 In the final stages, some very productive discussions I had with Cory and the team at SMS helped to bring Kratos into full focus and to really tie our prequel story to the character’s emotional journey in the new game, and then the scripts were off to Tony to do the heavy lifting of bringing the pages to life. And now all of that hard work finally pays off as readers get to see for themselves what we’ve come up with. I hope that everyone who enjoyed the new game checks out the prequel comic, and I hope that they enjoy it, too! Hope this evolves into some sort of game but this will quinch my thirst for now. Thank you. Will it also continue on ps4 as a motion comic? I have the first issue that I got for pre-ordering the game and really enjoy it as a motion comic. How many issues is this planned to be? 5? 10?